Right up there with running more and eating healthier, keeping up with the blogs I like to follow has been my easy way out of New Year’s resolutions the past few years. How many of you out there have also spent a good amount of time setting up your Google Reader only to let the new articles pile up so much that you give up on reading them all? As an alternative, I’ve recently moved over to Facebook, a site I probably visit too often as it is, as my “feed reader” of choice. If you haven’t done the same already, or if you are looking for better ways to keep up with the news and blogs that interest you, hopefully the quick overview below will help you out. First, there are some drawbacks to the Facebook only method. There are many blogs, especially some of the newer or individual educator blogs, out there that don’t yet have their own Facebook page or RSS feed in their profile. These blogs can’t (as far as I can tell) be brought into your Facebook news feed. And if you are one of those bloggers who isn’t yet importing your feed to Facebook, this recent article by italkless.com has a good overview on how it can be done. So how do you turn Facebook into an excellent news reader? Start off by making sure you “like” or “friend” all of your favorite bloggers, news sources, and websites. You will now find their articles and latest posts right in your live news feed in Facebook! While that is all you really have to do, you might want to create a new Facebook list and take advantage of the new live feed filtering options in Facebook. You will see in the image below that I have created a facebook list that includes all of my favorite news sources. This makes it easy to catch up on the latest posts when I don’t feel like seeing the status updates of all my friends at the same time. Create your list and then click on the down arrow in the upper right corner of your facebook homepage or news feed to filter. Want to share a post, ask others to visit a blog for comments, or show off cool student work? Use the hashtag #ebshare to let us know so we can re-tweet it for you! Introducing teacher challenges – open professional development! 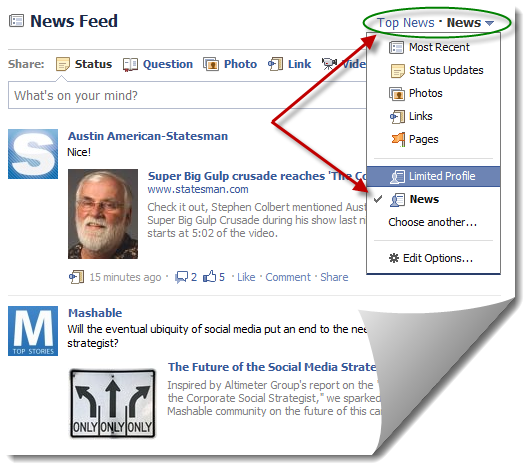 What do you think about using Facebook as a feed reader? Do you like mixing your personal/social life on facebook with work or news?